Marinate chicken in Greek yogurt and store in fridge for at least 1 hour. Process enough crackers to make 1/2 cup finely ground crumbs. In shallow bowl, combine cracker crumbs, parmesan cheese, pepper, and dried parsley. Dip marinated chicken in crumb mixture to cover and place on prepared baking dish. Bake at 375 degrees F for 30 minutes, turning half way. While chicken is baking, combine onions, bell peppers, thyme with grapeseed oil in medium sauce pan. Saute for 5 minutes and then add mushrooms. Saute for 2 minutes. Add chicken broth and sherry to sauce pan and cook for 5-6 more minutes. Transfer mushroom mixture to food processor or blender and blend until smooth. Add yogurt and blend until mixed into sauce. Return sauce to saucepan to keep warm. If sauce is too thick, add a little more sherry or chicken stock. 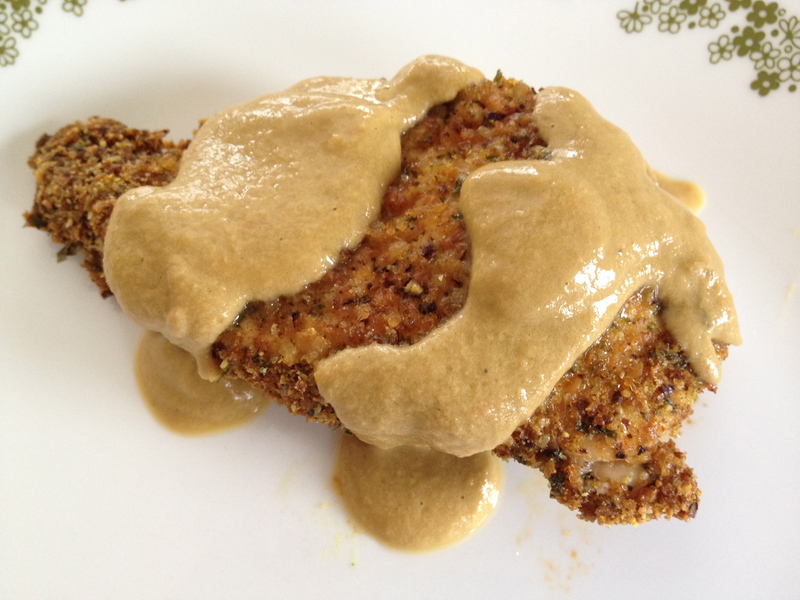 Serve warmed sauce on top of chicken or as a dip for chicken fingers.